In the early 70’s there was a revival of the Appalachian mountain dulcimer, although the term renewal is more appropriate as the instrument became a vehicle for modern music and new composition. A lot of the dulcimer’s popularity came from Joni Mitchel playing it on her 1971 album Blue. However, I found my dulcimer in 1968, so the revival was already well under way by the time her playing hit the airwaves. Rick Scott’s “Lotus Eater Blues,” 1977. Photo by Bonnie Carol. There were a few names that transcended borders and led the way of this renewal. 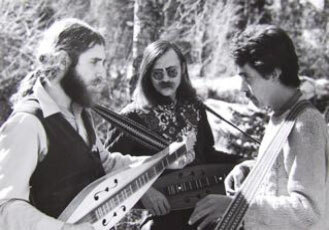 Robert Force and Al d’Ossche, a dulcimer duo playing guitar style, had written the most popular dulcimer howto book and were touring as a duo. I met them numerous times, on and off stages, up and down the west coast. They were very animated performers and always brought a smile to your face. Al has passed on now, but through YouTube you can still find Robert picking away throughout the US. Another great dulcimer player making a name for himself back then was Neal Hellman whom I shared a stage with a couple of times. I always felt him a bit deeper a player, and was always impressed by his technique. His concerts always had a warmth and intimacy to them, and he is still out there and better than ever. Another great was David Schnaufer, who probably had more success than anyone and living in Nashville probably helped. He played with Emylou Harris, Johnny Cash and a host of other big names, although his popularity was a bit later than those above. He was quite amazing and we met and played only twice, our styles were different but there was a lot of mutual respect between us. He passed far too early, as he had a lot more to give. Vancouver had a few good players as well and they still are active. Rick Scott, and Shari Ulrich both with Pied Pumpkin play guitar style dulcimer, although Shari’s main instrument was violin. Holly Arntzen is still an active environmental performer also playing guitar style. Rick and I taught a dulcimer workshop together as well, and had a real motley crew of inspired and warm-hearted students. I used to travel on my dulcimer in those days, hitchhiking across the continent and being given food and housing for a few tunes on the dulcimer. I met amazing people, jammed with hundreds of great musicians, and even fell in love a few times through the instrument. The most attention I ever received as a dulcimer player was recording Dulcimer Stomp on Aerosmith’s Grammy award winning album Pump in 1989. For some reason it didn’t make me that popular in the dulcimer world, but I got a lot of attention from rock fans! My dulcimer is still with me, built in 1970 by the great Michael Dunn, and an amazing instrument. I have played it on concert stages around the world and on numerous recordings. 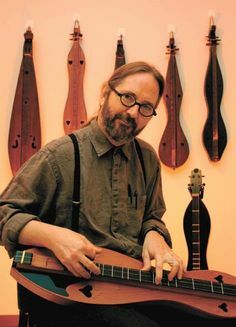 I have tried literally a few thousand dulcimers over the years, and the only other dulcimers I ever liked were the ones played by Schnaufer. Wish I knew who his maker was. Though most people prefer playing folk music on the instrument, I prefer to fully explore the modes and the plethora of alternate tunings. I play lap style, and definitely lean towards western ragas, as I often go off on long rambling improvisations. My explorations on the dulcimer are what led me to world music, and beyond. I would not have an instrument collection if I had not first explored other culture’s sounds and music on the dulcimer. So if you see or hear me somewhere playing something that you have never seen before from some remote village, you can blame it on my dulcimer. I have been privileged to hear performances by Robert Force, Neal Hellman, David Schnaufer AND Jerry Rockwell, as well as receive teaching from both Neal and Jerry. What a fine legacy they are leaving for upcoming generations! By the way, Steve Seifert probably knows who made the dulcimer David Schnaufer played the most, as they were close friends and performed together for many years. I always remember you as a wonderful player. What a treat to hear from you after all these years. Always was impressed by your playing as well. Neal: yup that is me at the back on the left, partially obscure. I remember that day! If you have a higher res version, I would love to get it. Nice article! 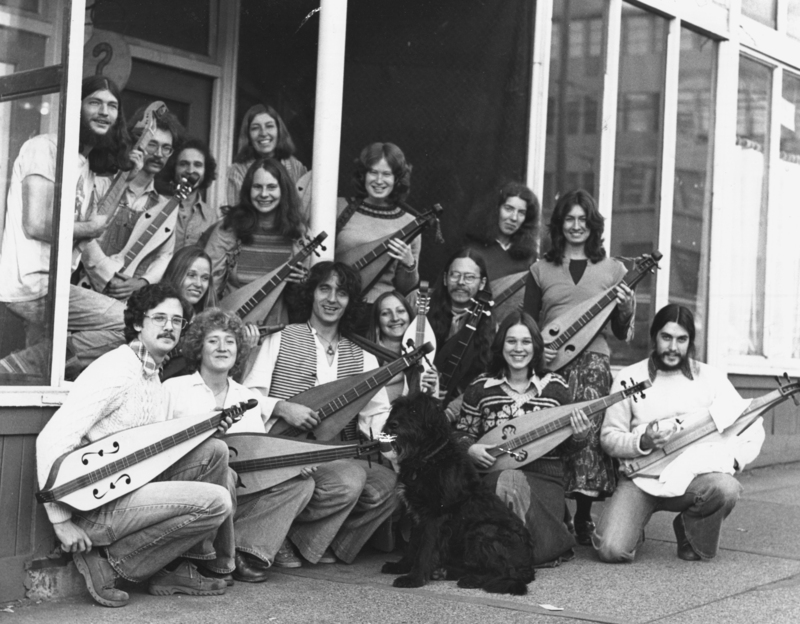 I’ve been trying to recall- speaking of the West Coast dulcimer renewal of the early 70s- particulars of a dulcimer gathering I attended with my friend, Loren Washburn (who made me my first instrument). I believe it was in Portland, in about 1973, and there were probably only a few dozen of us there. My memories of that time are a little hazy, for reasons those who lived it will understand, but that gathering, and Loren’s playing, set me on the path that led to my playing, and loving the instrument, today. Anybody remember that gathering? Might have been in a church, and we all put our dulcimers on the little stage, at the end, just to show the variety of shapes and sizes. Lovely, if hazy, memories.